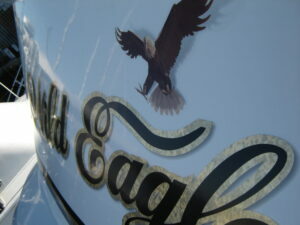 Digitally printed vinyl boat lettering with a gold leaf overlay. Photoshop’d Capt. Hat on doggie with a silver overlay makes for a unique boat name. 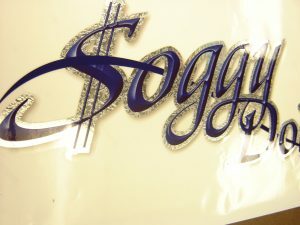 Digitally printed bevel letter face with a silver foil overlay. Digital print with gold leaf overlay. 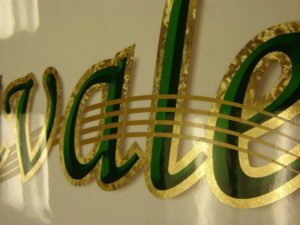 A metallic gold vinyl wave gives added contrast. Please find below examples of actual customer pages below from years past. These examples show the progression of design as we start with a few then end up invariably adjusting these through a series of iterations. 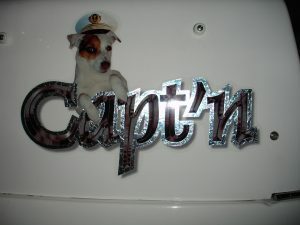 Note how each appears on the boat’s transom when clicked.